Ever had hummus? They're wonderful as dips for healthy snacking. 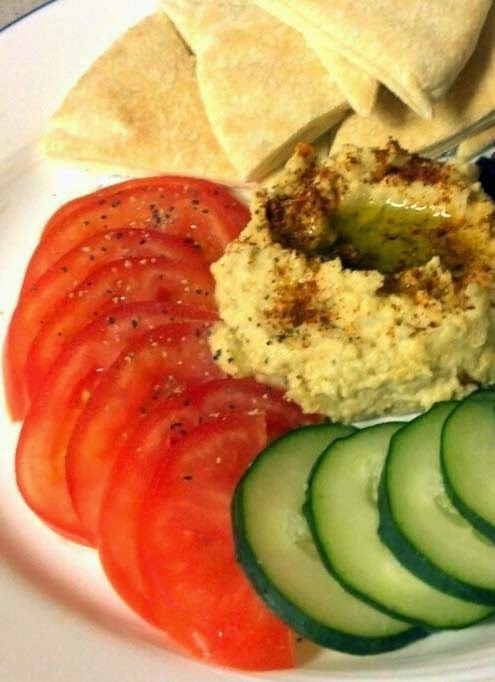 You can use any popular snacks to eat with hummus such as chips, bread, celeries, roasted asparagus, etc. A few days ago, I made something simple for my friends. It consisted of sliced tomatoes, cucumbers and pita bread. Simple, yet amazing. The recipe for the hummus is below. Combine tahini, garlic and lemon juice in a food processor until pasty. Then add chick peas and olive oil. Add water for consistency. Add salt and pepper to taste. Before serving, indent a well in the middle and pour olive oil. Garnish with cayenne pepper as final touch. In my opinion, you can never have enough tomatoes in your diet. It's a rich source of beta carotene for keeping your skin healthy and avoiding acne. Taste delicious, too.